An Earthsake Exclusive - back for the holidays. 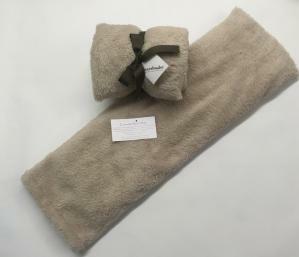 Warm BodyWrap - Warm NeckWrap - Toasty Toes & more! This Warming Collection of goodies is perfect for the season. They all have a lavender/flaxseed insert that can be heated to soothe tired bodies, necks, & feet. The plush heat wrap is a long shape to use anywhere its needed: lower back, mid-back, neck/shoulders, or on a pulled muscle. Simply heat in the microwave 1-2 minutes and enjoy cozy warmth for about 45 minutes. Pair with our plush warming booties that also heat up. Warm fuzzy footies with a warm fuzzy wrap - ahhhhhhh!